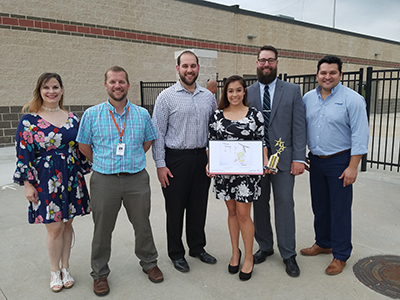 New Caney Middle School Art Teacher Colleen Vanek, New Caney Middle School Principal Eric Holton, Entergy Texas Program Manager Mark Delavan, New Caney ISD Student Ashlynn Cantu, New Caney ISD Energy Manager Paul Batchelder, and CLEAResult Senior Consultant David Rubalcava. From Dogwood Elementary, first-grade student Anthony Grimaldo and fifth-grade student Genesis Pena each earned top honors. Ashlynn Cantu, an eighth-grade student from New Caney Middle School was also recognized. Their posters were presented to the School Board and the students received an award and special recognition from Entergy Texas. “The students really enjoyed participating in the poster contest, and it is truly rewarding to see them understand the importance of being good stewards of our resources and care about conserving energy,” said Paul Batchelder, New Caney ISD Director of Facilities and Energy Management.